This entry was posted on Tuesday, November 6th, 2018 at 11:18 am. WESTBURY Leos are continuing their project of clearing the town’s Quaker graveyard and restoring it back to its original state, with the help of community groups and archaeologist, Julian Richards. Westbury Leos started the clear-up of the 300-year-old Quaker graveyard, behind Pinniger Finch & Co in the town centre earlier this year, finding the burial site of Matravers school founder, John Matravers. The original idea was formed by John Fryer, a member of Westbury Shed, who has been assisting the Leos with the project alongside other members of the group. 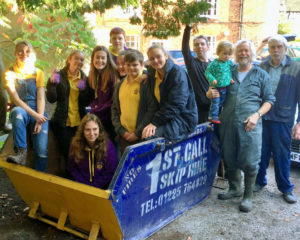 They have now filled six skips with builders’ waste and soil, which covered the graves, and the group expect to fill another two skips before Christmas when the site should be returned to its original level. On their last dig, on Saturday 20th October, they were able to expose the edge of a path which seems to run alongside the graves. Westbury Lions president, Nigel Coward said, “The Leos have received a huge amount of support from members of Westbury Shed and the community, with lots of people turning up throughout our dig days to help out. Sally Hendry, of the Heritage Society, continues to research the site, searching through Quaker birth, deaths and marriages to get an idea of who is buried there. She has also been looking at land ownership and tracing back the Matravers family tree. If anyone is interested in finding out more or offering the Leos support, they can get in touch via the website – westburylions.org.uk or via their Facebook page.